Here, i’d like to share a tutorial released by codecard.eu. It’s for the educational purpose only. Connect CarProg with A1 adapter to car OBDII. Load A3/TT 2009-2011 OBDII software. Switch ignition ON. Push “Prepare Unlock Dump” – odometer will be reseted to 0km. 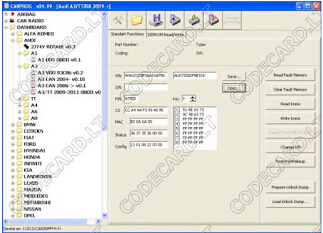 Load A3/TT 2009-2011 OBDII software. Note original odometer value. Push “Prepare Unlock Dump”. Odometer will be changed to 0km. 4. Press button “Load unlock dump” and load saved eeprom file. 11. Press button “Load unlock dump” and load saved EEPROM file again. Load new immo file with “Open” button. 18. Press button “Load unlock dump” and load UNLOCK DUMP file again. Load new immo file with “Open” button. NOTE: you could change km and program new keys with CarProg original. With CarProg HQ china clone, you can change km but need luck with key programming. For VAG immo, Xhorse VVDI2 is the best option. This entry was posted in Programmateur Calculateur Auto and tagged carprog full v10.3, vxscan carprog full on May 23, 2018 by sales.